Six electric buses will join Missoula’s Mountain Line bus fleet this summer as Missoula tries to fight climate change by becoming less dependent on fossil fuels. 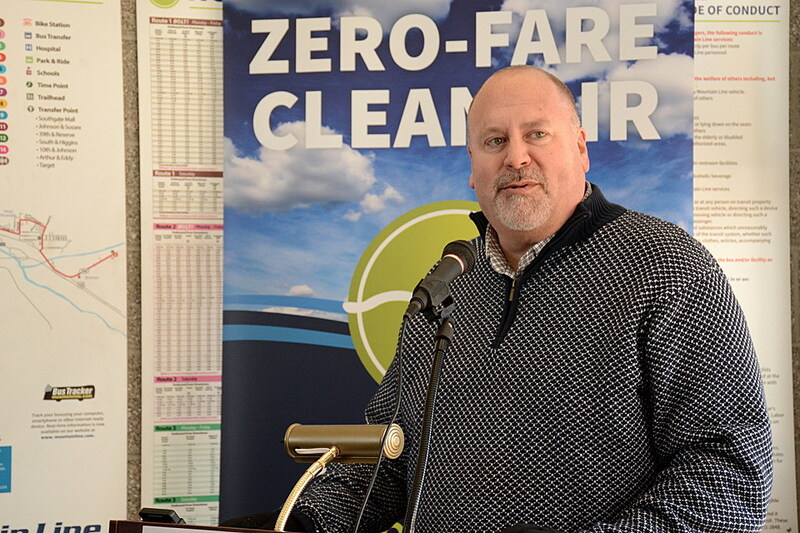 On Thursday, bus riders and city leaders gathered in the Mountain Line Downtown Transfer Center to celebrate the projected arrival of the electric buses and tout the achievements of the Mountain Line Zero-Fare program. Amy Cilimburg, chair of the Missoula Urban Transportation District Board of Directors, which operates Mountain Line, said the buses won’t arrive until July because Missoula had to get its grant before ordering the vehicles, which require some time to construct. In March 2018, the Federal Transit Administration awarded a Low or No Emission Grant of $500,000 to the Missoula Urban Transportation District. That’s now going to purchase the buses. Cilimburg said Mountain Line depends on the support of its 23 Zero-Fare business partners to contribute other funding. Then in August 2018, the University of Montana learned that it had received a similar award for $1.5 million to add three electric buses to the two in its fleet since 2016. Mayor John Engen gave a shout-out – as much as he could with a sore throat – to City Councilman Jordan Hess, who is transportation director for the Associated Students of the University of Montana, for researching electric bus options and finding the best ones to buy. Sen. Jon Tester was in Washington, D.C., but he congratulated Missoula in a statement read by his regional director, Deborah Fransden. “When it comes to addressing climate change in western Montana, the Mountain Line has been a leader and change-maker, and I’m confident that other communities and businesses will follow your lead,” Fransden said. 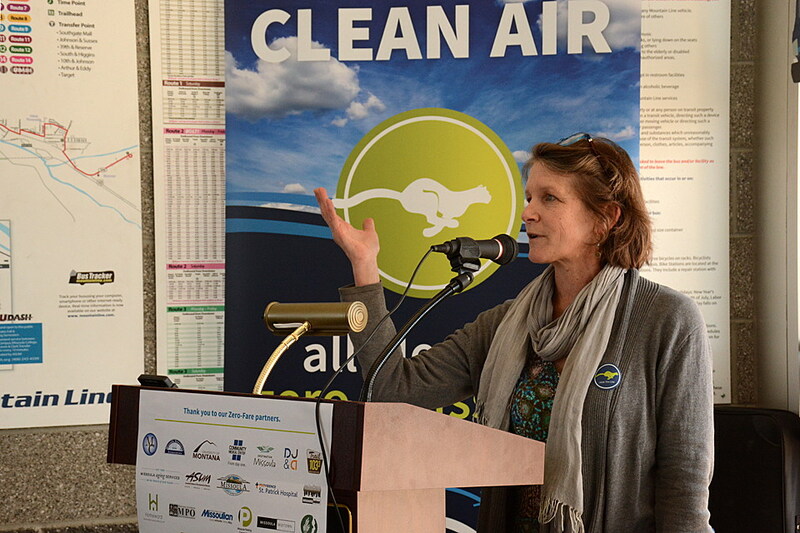 Ronni Flannery of the American Lung Association said electric buses won’t contribute to the particulate pollution produced by the diesel engines of other buses. Approximately two-thirds of transportation-related particulate pollution comes from diesel engines. Every winter, Missoula struggles with air pollution made worse by inversions, so the fewer diesel vehicles, the better. “There are no tailpipes on these (new) buses and thus no health- or climate-harming pollution. And that’s a huge deal for all of us, especially when it comes to our health,” Flannery said.